Air Enterprises has the knowledge, experience and capabilities to execute full turn-key AHU projects, from cradle to grave, as well as dedicated project management for each design and installation ensuring consistency after delivery. 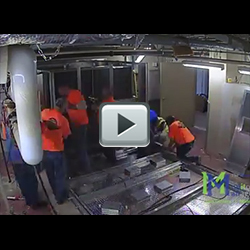 Watch as an old Air Handling is torn out and a new Custom Air Handler is built on site in less than 2 days. 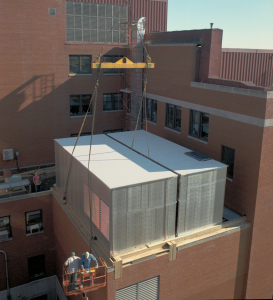 This Air Handler serves a highly critical medical facility: A Cardiac ICU Wing. The old air handler was loud, dirty and unreliable. It had an air leakage rate that was over 10%. This was costing the hospital significant energy losses.